You must be a member of the Cologne Run - Jog - Nordic Walk Group to attend this activity. Would you like to join this group? P L E A S E • R E A D • D E S C R I P T I O N; T H A N K • Y O U ! We'll walk the south bound round course with a total distance of about 8.5 km depending on the route and our speed. And attending that group activities is also really nice. Please consider to wear a headlamp depending on the start time, season and weather. I usually wear a headlamp if I know it's getting dark. You need comfortable sports wear and (NordicWalking) shoes. 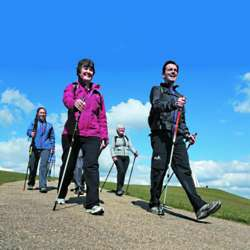 A pair of NordicWalking sticks would be very helpful to keep up the speed and to integrate the upper body. The activity will be carried out in almost all weather conditions! Start and finish is the at Elisabeth-Treskow-Platz (between Bona'me and Limani). First we'll walk along the Rhine to the Rodenkirchener Brücke. There we'll cross the Rhine and walk back on the other side of the river until the Südbrücke to cross the Rhine again. If you have any question, write a message or leave a comment. In urgent cases you can message or call me on my mobile phone. The nearest get-offs and jump-ons are Ubierring Stadtbahn 15, 16 or Buses 133, 142. Of course nowadays everything can happen and you are not able to attend. But if so, please inform me at least 1 h before by phone/sms. Please don't use the massaging service of InterNations. For phone or SMS I don't need internet access. So it's more reliable! I'd appreciate it very much. The phone number is displayed above on the right.